Definition at line 27 of file CEvaluationNodeStructure.h. Definition at line 33 of file CEvaluationNodeStructure.h. Definition at line 25 of file CEvaluationNodeStructure.cpp. Definition at line 29 of file CEvaluationNodeStructure.cpp. References CLOSE, COMMA, fatalError, INVALID, CEvaluationNode::mPrecedence, OPEN, PRECEDENCE_STRUCTURE_CLOSE, PRECEDENCE_STRUCTURE_COMMA, PRECEDENCE_STRUCTURE_OPEN, VECTOR_CLOSE, and VECTOR_OPEN. 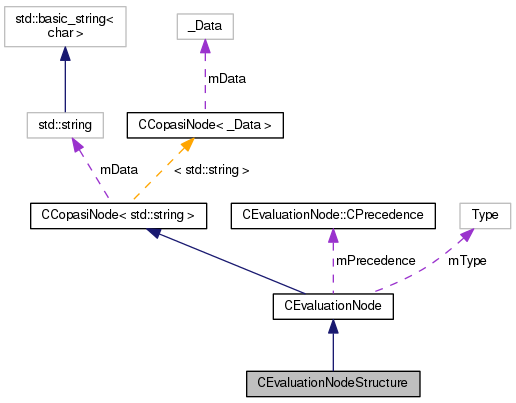 Definition at line 55 of file CEvaluationNodeStructure.cpp. Definition at line 59 of file CEvaluationNodeStructure.cpp. Create a new ASTNode corresponding to this structure node. 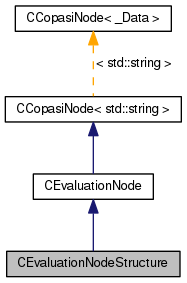 Definition at line 61 of file CEvaluationNodeStructure.cpp.